Made with REAL Wonka Nerds! These multi-colored gumballs come in 5 different flavors and are jam packed with Wonka Nerds candy inside. 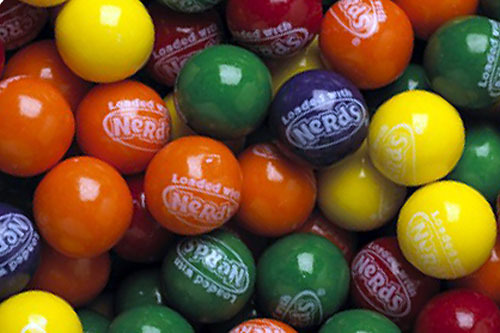 All of these gum balls are printed with the white Nerds logo and read, 'Loaded with Nerds'. Give them a shake to hear the Wonka Nerds rattle inside! This mix comes in our traditional 1 inch size and includes Lemon (Yellow), Lime (Green), Orange (Orange), Grape (Purple), and Cherry (Red). They also come in our larger 1 & 1/8" size and are a great treat around the house for you or your kids. You can choose between a 1 pound bag or a 2 pound bag of gumballs, and shipping on orders up to 2 pounds is only $5.00!